Cockroach problems can be exterminated for good under professional care. The treatment from Pest Pro Exterminating will stop a problem at its source so it doesn’t reoccur. Cockroach control and management are important not only because they are extremely unpleasant to look at, but also because of health and safety reasons. These pests are known to cause allergies, trigger asthma attacks, and spread over 30 kinds of bacteria including E. coli and Salmonella. Visibility- Cockroaches prefer to live and and feed in the dark, so they are not always easily seen during the day. They can flatten their bodies and fit into narrow areas so you might find them hiding under rubber mats, behind wallpaper, and within wall cracks. Feces- A visible sign of infestation will be cockroach feces. They resemble coffee grounds or black pepper, while some of the larger roaches will leave cylindrical droppings. Odor- Some species of cockroaches will emit an unpleasant smell. They will leave a strong oily or musty odor in the air. Remnants- You will sometimes find oval shaped egg cases behind furniture and in other tight spaces. These pests reproduce and multiply very quickly. For every one that you see, there will be a lot more hiding in your home. Because they are nocturnal, it is likely that when you see one during the day it means they were forced out of hiding by overcrowding. There are many different species of cockroach and some can even survive harsh winter climates. 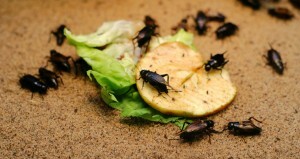 The debris from cast-off skins, dead bodies, and droppings of cockroaches can aggravate allergies. Children and sensitive individuals are particularly sensitive to cockroach debris. It’s important for a do-it-yourselfer to know that cockroaches are way better at hiding than you are at finding them. And, unfortunately, their eggs have heavy protection from over-the-counter remedies. Without the knowledge and equipment of professionals such as Pest Pro, cockroach extermination can be a frustrating, losing battle.